Sit back and enjoy the most enjoyable, relaxing vacation ever! Everyone needs a seaside vacation. Why not enjoy one any time you like with this ultra-relaxing CD! With the aid of our guided visualization, you’ll imagine yourself soaking up the sun on your favourite beach. Close your eyes and let the cares of the world melt away, as you listen to the waves gently lapping on the shore. There’s nothing to worry about here, so just stretch out on the warm, dry sand and relax. Breathe the good fresh air. Taste the salt in the lightest of sea breezes. Listen to the distant cry of seabirds circling far overhead. 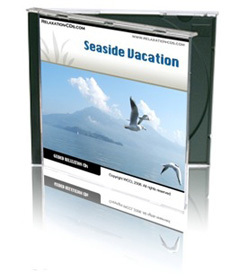 This is your perfect seaside vacation, and it’s here, on this CD, any time you need it. And when your vacation is over, you’ll feel relaxed, refreshed and invigorated – ready to face the world again – but with that little bit of paradise in the back of your mind, always waiting there to sustain you!